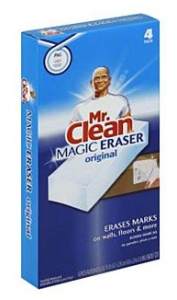 Free Mr. Clean Magic Erasers | A Savings WOW! You can get a 4-pack of the Original Mr. Clean Magic Erasers for FREE after cash back at Kmart! We’ve used Mr. Clean Magic Erasers to get some really tough stains out from various parts of our home. It comes in handy, especially if you are starting your Fall cleaning. – Sign up for a free Shop Your Way Rewards account (and have me as your Concierge Personal Shopper). If you have a Shop Your Way Rewards account already, be sure to login with the link to add me as your Concierge Personal Shopper. I’ll be able to share more deals, coupons, and help you with your shopping needs! – Next, create your free topcashback account to start earning cash back on your purchases. – Search for “Kmart” on topcashback. – You will be taken to the Kmart website after you click on the “$3.49 Cashback” orange button. – Make sure you are signed into your Shop Your Way Rewards account so you can earn points on this purchase. – Use the searchbar to search for Mr. Clean Magic Eraser, Original, 4 pads. – It should locate the Mr. Clean Magic Eraser, Original, 4 pads product – make sure it is listed for $2.99. – To get the full $3.49 cashback, add ONLY the Mr. Clean Magic Eraser, Original, 4 pads to your cart and choose in-store pickup. – Your cashback will be added to your topcashback account within seven business days. You’ll also receive your Shop Your Way Rewards Points on your purchase. I love Magic Eraser and getting them for FREE is even better! Thanks for sharing.